Pappagallo’s (Indian Harbour Beach, Indialantic, Satellite Beach) has had the pleasure of many characters coming through our restaurant doors some go behind the counter and some sit in the dining area, I almost forgot the phone calls and more recently the web orders. I have written before how Pappagallo’s (Indian Harbour Beach, Indialantic, Satellite Beach) had become somewhat of a home away from home for some of the staff during those early days. I think of it back then as a place like the clubhouse from the little rascals only we served food. Louie came to us through another staffer, most of our people got a job that way back then, theirs friends would bring them into the restaurant and say hey my buddy needs a job. On occasion we would need some help and I would simply ask, ”anyone have any friends looking for work?” I’d like to say that this was my own genius plan but I didn’t have interviews and employee handbooks back then it was just how we did things. I did notice few things come of this sophisticated hiring process, if we had one good employee it became obvious that their friend might be equally equipped to join us in the clubhouse. It didn’t always work that way some didn’t work out for various reasons. I mean we can’t teach everyone the secret handshake, you have to prove yourself first. Louie was a big guy not overly tall but very husky, he had just returned home from state college and joined us while he was looking to finish a few courses before securing his career. Louie was slightly clumsy and sometimes a little loud but he had a heart of gold and became a true friend, even after he went on to his career in the corrections department for the state of Florida. 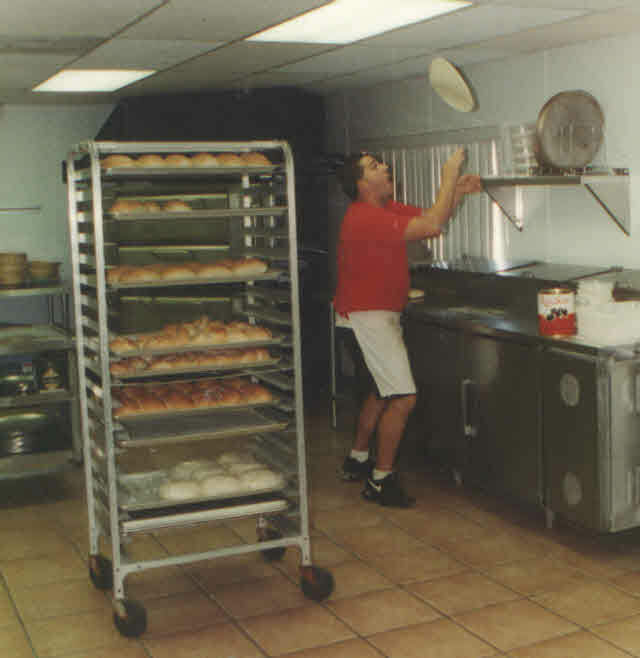 Louie never stopped working with Pappagallo’s (Indian Harbour Beach, Indialantic, Satellite Beach) he would come by to say hi or just catch up and before you knew he was making a sub or taking something out of the oven, just helping out, that was how Louie was. After he became a trusted member of our team he came to me one day and asked if it was ok if he came in to the restaurant before we opened and have breakfast. Seemed like an odd request but he said sometimes it got too hectic at home and he just wanted to eat his breakfast in total quiet. I guess after years at school he got used to waking up and having some time before he started his day. It made sense to me so his box of captain crunch with crunch berries came with the key to the kingdom of Pappagallo’s restaurant in Indian Harbour Beach. I have to admit there were more than a few times I’d walk in to the restaurant at 6am to start the bread for lunch and I’d be taken back because I forgot that Louie was there eating his cereal. He didn’t stop at the restaurant everyday so I never expected it till I would walk into the dark cavern of Pappagallo’s Indian Harbour Beach to be greeted by the crunch of Louie’s cereal. One afternoon while Louie wasn’t at work we had the misguided idea to steal the berries from Louie’s cereal. We didn’t eat them we just sorted through the box, picked the berries and put the rest back in the box. We kept the stash of berries in the restaurant to be returned later. A few days went by and I had honestly forgot about our little prank. Louie come in that afternoon because that morning he had discovered that he had been the victim of the great berry heist of 1993. Let’s just say he was less than happy about our little gag. We tried to calm him down by revealing we hadn’t in fact stolen his berries we had just separated them. We quickly reunited the cereal with the berries in a large bowl and put the mixture back in its factory box. Louie walked out mumbling something about a, ”sick joke,” as the rest of us were in tears from laughter but relieved he hadn’t killed anyone . The next morning I found Louie in the dark restaurant with his bowl of cereal, I asked how his breakfast was this morning and he said “better than yesterday but still not as good as it was before we took the berries out.” Apparently there’s a crunch to berry ratio that only the factory could achieve and we had ruined that box. I took up a collection from the rest of the guys and we bought Louie a new family size box of crunch berries. We gave him his new box and apologized for our cations and promised not to touch his cereal again. The thing about Louie is he was always ready to help anyone with anything. Many times I would need help with things ranging from running to pick up supplies to lifting an old cooler out from behind the bar to put a new one in. If I called Louie, all I had to say was I needed a hand and he’d immediately answer I’ll be right there, he never asked what it was or how long it would take, he was just there to help. They don’t make men like that anymore, he’ll I don’t think they ever made very many that were like Louie. Years later I was in another location we had opened. We were open for breakfast, it was 7:30 and I had come to the realization that our waitress hadn’t shown up. Louie stopped by just to say hi. He had some time to kill so he thought he’d come by for one cereal. Just kidding we didn’t serve Capt crunch. Louie jumped right in and he and I took on the task of breakfast servers. We had no idea what we were doing. We were honest with people as they came in and told them that today’s service will be friendly and maybe a little weird at times. Louie and I made it through that shift! We had a blast and I think the people there that day enjoyed watching these two guys run around in circles. It came time to split our tips. Louie refused to take any money and I refused to let him refuse. After a few minutes we decided to take our $82 dollars and go next door to the gas station and buy scratch off lotto tickets. Since that wasn’t considered pay, he would have no problem taking half of whatever we won. We lost 82 scratch offs in a row, actually that’s not true. We did win two free tickets and those two were losers as well, so make that 84 times in a row. I miss seeing Louie just stop by to shoot the breeze or challenge me to a quick round of rocky trivia. He’s probably the only guy I couldn’t stump with an obscure question like… what were Rocky’s turtles names? There was no phone with google on it then, and even when it came around we refused to use them. I had no idea that was the last time I would see him. I did talk to him via text a few days later. My wife had competed in a bodybuilding show (for the record she did figure class.) I had posted something to Facebook about how proud I was of her and Louie responded via text to tell me how cool he thought that was. He told me he had spent the day fixing his own car and he was proud that he did it and how much money he had saved. We said goodnight and we’d see each other soon. The next day I got a phone call from his wife. She was crying uncontrollably and I instantly knew it was bad news. She told me that after he texted me he came upstairs and they were getting ready for bed. Louie had collapsed in his bedroom and they had to call an ambulance to come get him. He died that night, and we lost a family member. Louie was definitely family! I think of him often and to this day I sometimes forget that he’s gone. I always think that god must have needed some help in heaven and he knew that Louie would never ask what he needed help with or how long it would take to do… Louie would be there. Every time I find myself passing the Captain crunch cereal in the grocery store, I smile first and then shed a tear for my friend Louie who was definitely gone too soon. Louie was another man I had the honor of knowing because of a small pizza joint in satellite beach.